If you’re in Ecuador in December, don’t miss the celebrations in Cuenca that culminate in the Pase del Niño Viajero, considered to be the largest and best Christmas pageants in all of Ecuador. 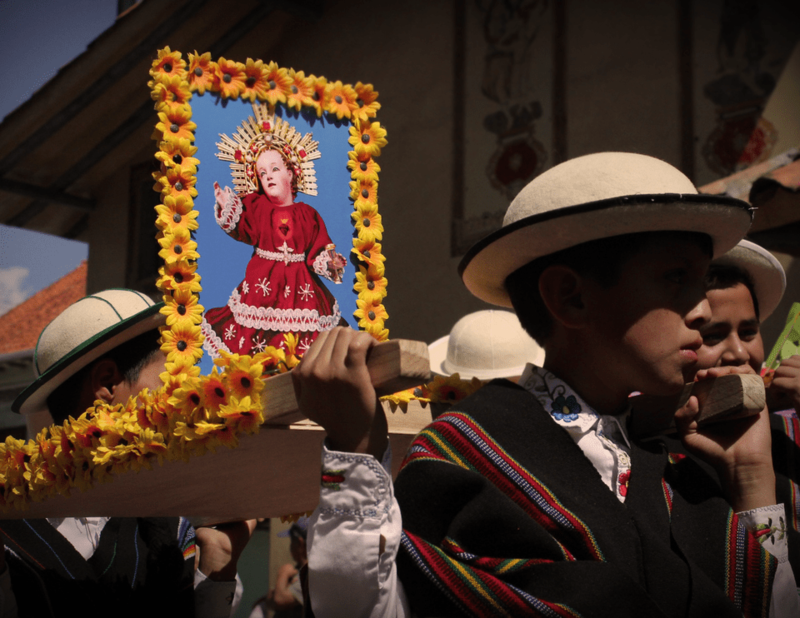 Children form a large part of the festivities honoring the traveling Infant Jesus. The origin of this religious festival is from the early 1960’s when a statue of the Christ Child was taken to Rome to be blessed by the Pope. When the statue returned, someone in the watching crowd called out, “Ya llegó el Viajero!" and the statue became known as the Niño Viajero. Today, Christmas festivities begin earlier in the month with Novenas, masses, and events recalling the journey of Mary and Joseph to Bethlehem. The highpoint of the celebrations is the festival of the traveling Infant Child, the Pase del Nino Viajero on December 24. It’s an all-day affair, with a parade that illustrates the journey of Joseph and Mary. Led by the guiding star, and accompanied by angels, the Three Kings, officials, shepherds and huge numbers of costumed children, the parade begins in the Barrio del Corazón de Jesús, from where it proceeds to the Centro Histórico along Calle Bolívar until it reaches San Alfonso. From here it follows Calle Borrero along the Calle Sucre until it arrives at the Parque Calderón. In the park, a representation of Herod’s edict, calling for the deaths of male children, takes place. The Niño is then taken to the Catedral de la Inmaculada for religious services honoring the birth of Christ. The route loops through the streets of Cuenca. There are floats illustrating religious themes as well as the principal float carrying the Niño Viajero, borne by clerics. Along with the religious nature of the procession, there is also the native influence. Horses and llamas, carrying local produce, chickens, and sweets march together with musicians, creating a rich, colorful and musical display. The Tucumán dancers perform the Baile de Cintas in which twelve dancers wind ribbons around a pole, resembling somewhat a May dance. This isn’t the only procession with a Christ Child statue, for there are others, and each is returned to its home church following the end of the blessed statue of the Niño Viajero. The Pase del Niño Viajero is the second in a series of Cuencan Pasadas celebrating the Infant Jesus. The first takes place on the first Sunday of Advent. The third is the Pase del Niño on the first of January, and the last is the Pase del Niño Rey, on the fifth of January on the day before the Dia de los Reyes Magos, Epiphany, when children receive presents from the Magi. In Quito, as in the rest of Ecuador, Christmas festivities are a mix of religious, civic and personal celebrations. During the month of December, Pesebres, or nativity scenes, are erected in various locales. They are often quite elaborate, with traditional scenes of the manger, and figures clothed in local or Ecuadorian costumes. Sometimes, the figures in the pesebre are real, men, women, and children performing the ancient story. On Christmas Eve, families enjoy the Cena de Nochebuena, which traditionally includes stuffed turkey or chicken, grapes and raisins, salads, rice with cheese, local produce and wine or chicha. Once the children are asleep, parents leave their presents at the foot of their beds. At midnight, the Misa del Gallo attracts huge numbers. This mass is a lengthy affair. Christmas Day is a family day, with gifts and visits. Following the Christmas celebrations, Ecuadorians create effigies or dolls stuffed with hay and fireworks. These figures are representations of disliked people, national or local officials, famous people or folkloric characters and will be ignited on New Year's Eve, at the Fiesta de Año Viejo.